Our private room was huge and had a table and chairs to sit at which was awesome. We also had a mini fridge. Shared bathrooms are large, close and very clean - you only share with one other room and we never actualy saw anyone else in them. Good location, walking distance to the beach. We hired a scooter everyday and could go everywhere we needed. Staff helpful and organised a bus for us. Nice, clean, would stay again. Right next to the beach and affordable, which is all I needed. Staff speak English and will help you if you ask, but don't offer up anything other than the wifi password and the code to get into the perpetually unlocked building (there is always someone at the front desk). Kitchen, common space available for use, though fairly unutilized by guests. Breakfast is good too! I thought I saw that hostel guests get discounts at the restaurant -this either isn't true or I asked too late. 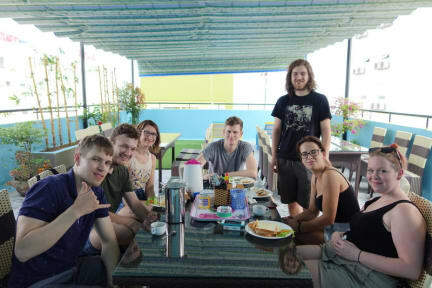 Nice little hostel, bed sheets were kept clean, common room and bedrooms had good AC. Breakfast + coffee was also yummy. Free shuttle to Hoi An was nice deal. Cons it was relatively empty when I stayed so not much going on and some AC unit next door was quite loud when it was on so not the most quite sleep. I stayed in the hostel for one night and it was ok. There we're only 5 people staying in the hostel in total. The matterss was not conftable and the bathroom Not realy clean. The staff was friendly and it is close to the beach. The place was completely empty and the free beer and walking tour did not exist! However the place is in general clean and staff is friendly. After 2 minutes the water in the shower stopped, my lamp in the room didn't work. Just 1 of the staff Could actually understand anything. But the breakfast was good. AC was not working in our room so we had to change it after short time. The bathroom especially toilet was not clean; fridge was molted very much. The second room smelled very much after the sink. The staff was nice but the communication was very hard since they spoke very poor English. We couldn't get therefore the normally highly appreciated hostel recommendations about sightseeing and stuff. I would choose definitely a different hostel for next time. 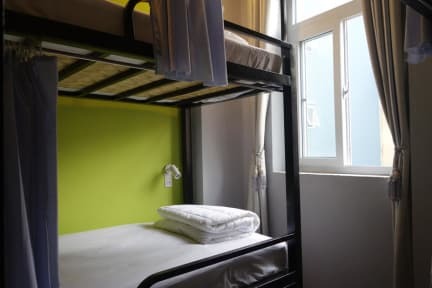 We felt like we were the only 2 people staying in this hostel and the room looked horrible with the paint coming off the wall and the beds rock hard. Zero atmosphere since we were the only ones. The bathroom was good tho and the free breakfast as well.